The magic began in 1989 when importer Robert Haas of Vineyard Brands and the Perrin family of Chateau de Beaucastel finally found what they were looking for in the Las Tablas district on the west side of Paso Robles: a parcel of land that closely resembled the soil and climate of the Rhone's famous Chateauneuf-du-Pape appellation. They had been looking all over California for a spot where Rhone varietals would flourish, and where they could practice viticultural methods that were lighter on the land and reflected the best traditional practices. Once they found the land, Haas and the Perrins decided to bring over cuttings from Beaucastel to plant in the Paso Robles soil. Focusing on the 14 varietals approved for planting in Chateauneuf-du-Pape, including Grenache Noir, Mourvedre, Syrah, and Counoise, in 1990 they brought over the first vines from France. When they entered the US they were promptly quarantined to prevent any infection or infestation from spreading. Three years later, in 1993, the first Beaucastel cuttings were released and planted. In 1997 the partners harvested their first grapes. Since that time they have continued to bring new cuttings into the US from France. The most recent grape varietals to be brought over include the lesser-known, and rarely cultivated, Bourboulenc, Cinsault, Clairette, Picardin, and Vaccarese. Out of quarantine and in Paso Robles, the Tablas Creek team nurtures the cuttings into maturity in special viticultural nurseries and then in organic vineyards. Tablas Creek has been a pioneer of organic farming, and they continue to not only make great wine but also protect and preserve the environment. Cover crops, like the peas, oats, and vetch pictured to the right, are planted each winter. Each spring, they burst into flower and then are either mowed or tilled into the soil to build up the nutrients. 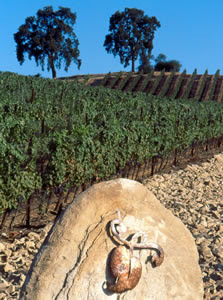 (picture courtesy of Blog Tablas Creek). The vineyards received their organic certification in 2003, and Tablas Creek continues to actively seek ways to sustain the land. In early 2006, for example, Tablas Creek finished a wetlands project to recycle wastewater from the vineyards and provide a habitat for local wildlife. Along with winemaker Neil Collins, Haas and the Perrins make wines that combine textbook varietal characteristics with Paso Robles terroir. Old World Rhone wines are known for their artful blends, and today Tablas Creek follows in this tradition with their flagship New World wines, the Esprit de Beaucastel Rouge and the Esprit de Beaucastel Blanc. Named to convey how Tablas Creek strives to match the spirit of the famed Chateau de Beaucastel wines, these wines are not imitative of Chateauneuf-du-Pape so much as they are unique Paso Robles interpretations of the classy and flavorful wines of the Rhone region. 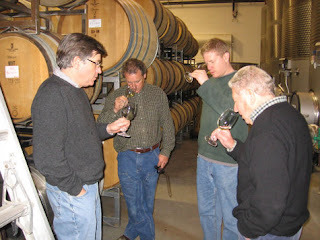 (picture of Francois Perrin, winemaker Neil Collins, general manager Jason Haas, and Robert Haas blending varietals in the cellar courtesy of Blog Tablas Creek). Tablas Creek wines are special wines, and if you've not had one I urge you to try them soon. Prices indicated are the suggested retail price at Tablas Creek's online wine store, where you can purchase the wines listed below. Substantial discounts are available to Tablas Creek VINsiders, the wine club that you should consider joining in order to get limited releases and special bottlings. Clicking on the highlighted name of any wine will take you to Wine-Searcher, where you might be able to find a merchant in your area who stocks Tablas Creek wine. As always, the price in your area may be higher or lower than those here. In my area, for instance, it is often possible to find the superb Cotes de Tablas wines for under $20. 2005 Tablas Creek Esprit de Beaucastel Blanc ($35) An arresting white wine that is both rich and bright. Citrus and floral aromas give way to complex flavors of lemon, herbs, and honeysuckle. All this is wrapped up in a pleasantly silky package. Roussanne dominates the blend, with Grenache Blanc and a touch of Picpoul to add interest. Excellent QPR. 2004 Tablas Creek Esprit de Beaucastel Rouge ($45). This is a “wow” wine. When I took my first sip I just had to shake my head in disbelief at the range of flavors it manages to hold together. Mourvedre, Syrah, Grenache and Counoise provide a cascade of plummy, spicy, and mocha-inflected flavors that go on and on, developing distinct notes of clove and cherry. This is magic in a glass. If you have a special dinner in your future, buy a bottle of this wine for it. If you were blessed with a baby this year, or know someone who was, buy a bottle of this wine and open it on their 5th, 7th, or 10th birthday. If you can wait that long, that is. Excellent QPR. 2004 Tablas Creek Cotes de Tablas Rouge ($22) Be prepared for enticing aromas and flavors of raspberry, spice, and flowers in this excellent blend. A mixture of Grenache, Syrah, Mourvedre, and Counoise grapes are blended into a wine where nice dustiness and floral characteristics are balanced out by the ripeness of the syrah fruit. Excellent QPR. 2004 Tablas Creek Grenache Blanc ($27) Absolutely gorgeous—it’s the only way to describe this outstanding silky white, that has both juicy fruit and excellent balance. Aromas and flavors of apple and citrus are touched with honey. If you’ve never had a Grenache Blanc this is the one to try. Excellent QPR. 2005 Tablas Creek Cotes de Tablas Blanc ($22) An excellent white blend made from Viognier, Roussane, Marsanne, and Grenache Blanc. The Viognier is apparent in the floral, perfumed aromas. Crisp citrus flavors and a juicy finish make this a wine that should appeal to everyone at your dinner table this summer. Not a harsh or acidic note mars this balanced wine. Excellent QPR. 2004 Tablas Creek Roussanne ($27) This wine has pronounced aromas of melon, and the melon is echoed in the flavors. There are some soft floral and zingy citrus notes, too, which makes for an easy drinking summer white that would be terrific with crab, chicken—you name it. The wine has a rich, heavy mouthfeel that only adds to its attractions. Very good QPR. 2004 Tablas Creek Mourvedre ($35) I absolutely loved this textbook example of a mourvedre. Abundant aromas and flavors of black cherry, blackberry, and spice are accented by a meaty, leathery note. The finish gains complexity with some dusty earth. The folks at the vineyard think that this wine will remain drinkable through the end of 2007, then enter a closed period for a few years, before opening up again with (I suspect) even more richness and complexity. Very good QPR. Tablas Creek has a fantastic web site with more layers than an onion and enough good reading to last your entire weekend. Of particular note are their varietal profiles and the scrumptious recipes that accompany each wine description. And, if you haven't checked out Jason Haas's great blog, do so. He's a wonderful writer, the photographs are superb, and you come away from each visit feeling that you've gained a real sneak peak into the life of this very special--even magical--vineyard. Hi, Joel. Thanks. I loved writing it, and the Paso Robles wine thing just keeps rolling. Great, great wines coming out of that area. 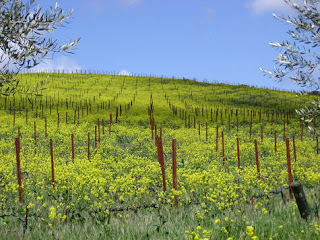 Thanks for the great write-up, and thanks for turning me on to the Tablas Creek blog! As a sustainability-geek for my "day job", I love hearing about wineries that are adopting organic/sustainable practices. This one's a double-whammy, since I've had Tablas Creek wines on several occasions and have always enjoyed them, but this just gives me one more reason to support their efforts! Nate: so glad you liked it. Jason is really good at explaining the "sustainable stuff" on the blog, and I am fascinated by this new tractor attachment that they have for clearing the weeds between the vines. Does that make me a sustainability geek, too? It is a beautiful thing when you find our your good tasting wine is good for the environment, too! Since many of these wines may be something folks would like to stock up on, they should keep in mind proper wine storage ideas. First, make sure you get the wine home safely - don't leave it in your car while you're out tasting wine. Secondly, if you don't have already, get a decent wine cooler. You can get a 12 bottle wine cooler for around $100. Check out thiswine cooler buyer's guide. That way, when someday in the future, you're reminiscing about that wine tasting trip, and want to recapture the essential experience, your wine will be ready, and every bit as good - or better - than they day you bought it.